After being together for 10 years, a Maui Beach Elopement was the perfect option for this sweet couple! We love how these high school sweethearts chose to start their new marriage with an intimate ceremony. With this being their very first trip to Maui, they are already looking forward to coming back for their anniversary! 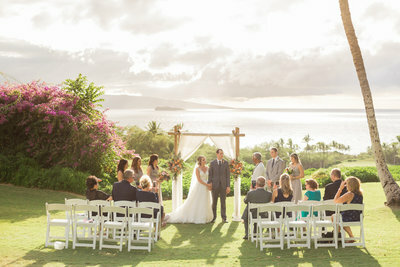 That’s another one of our favorite things about Maui weddings, it is the ideal place to visit year after year to celebrate a thriving marriage. Who wouldn’t want to revisit these majestic beaches? We can’t think of a better anniversary tradition! Hali was a glowing bride and couldn’t have been more thrilled to finally be marrying the love of her life! 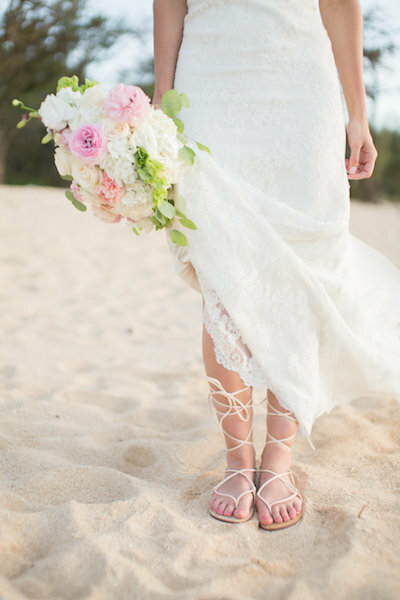 She requested a Rustic Hawaiian Bouquet and Flower Crown with shades of pink to create a soft whimsical look for their Maui Beach Elopement. We applaud how Austin chose to ditch the traditional white button up for a light pink shirt with rolled up sleeves. Paired with a boutonniere and grey slacks, this groom looked wedding-ready. It was inspiring watching these two share their love for each other and excitement for the future! We have no doubt they will experience a lifetime of joy as husband and wife! The newlyweds called it a night by holding each other close, enjoying the last few moments at Southside Beach in front of the setting sun. The future is bright for these two! 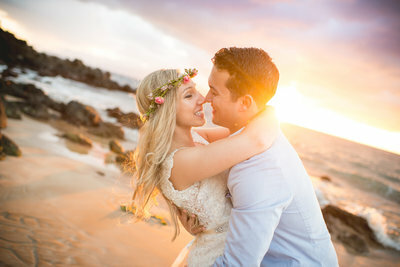 Thank you, Hali and Austin, for trusting Simple Maui Wedding to make all of your Maui Beach Elopement dreams come true. We wish you all the best on the journey ahead as husband and wife! Congratulations and Warm Aloha!